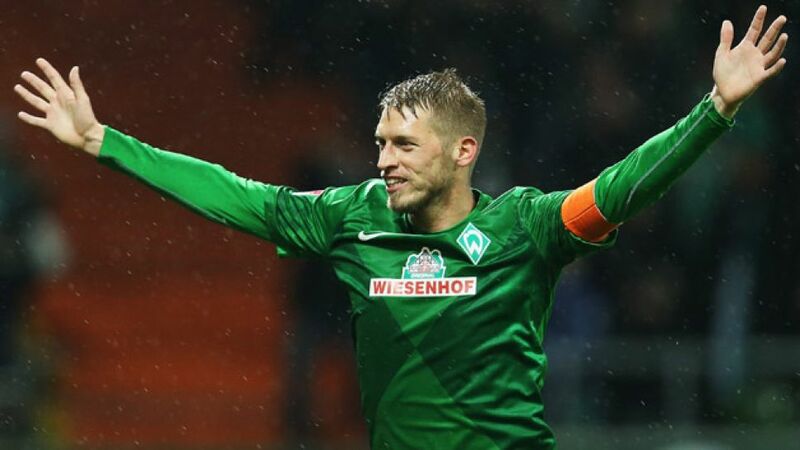 Bremen - A goal in each half from Aaron Hunt gave Werder Bremen a narrow 2-1 victory over 1. FSV Mainz 05 in an enthralling clash at the Weserstadion. Captain Hunt put his side in front by crashing in a first-half strike, and though Mainz rallied through Adam Szalai’s header, Hunt would have the final say, curling in a sumptuous free-kick late on. Werder may have suffered four defeats in nine games this term, but they came into this game on the back of last week’s crushing 4-0 win over Borussia Mönchengladbach. The hosts were greeted by an expectant home crowd, but it was Mainz to whom the game’s first opportunity fell. A weak shot from Szalai, scorer of a treble against Hoffenheim last week, turned into a superb pass for his strike partner Nicolai Müller, but his chip over the onrushing Florian Mielitz drifted wide. Bremen then took full advantage of the let-off and stole in front with a goal from their captain and leader Hunt. Marko Arnautovic’s pass picked out the run of Nils Petersen, and his cutback was met perfectly by Hunt, who made a difficult finish look very easy with his unfavoured right foot. Mainz were not discouraged, however, and Mielitz had to again be alert to keep out Müller’s low drive, with Szalai waiting to pounce on the rebound. Both teams’ predilection to switch quickly between defence and attack, coupled with the greasy playing surface, contributed to an entertaining and fast-paced game, with further chances falling to both teams. Bremen’s Eljero Elia cracked a low drive onto the post, before Andreas Ivanschitz then spurned a glorious chance to equalise. Bremen defender Sebastian Prödl’s weak back-pass left Mielitz stranded, but Austrian Ivanschitz never looked comfortable as he advanced on goal and shot wastefully wide, allowing the home side to go in at the break in front. Despite trailing during the interval, there was much for Thomas Tuchel’s Mainz to be pleased about in their first-half display, and they began the second period determined to strike first. Ivanschitz almost provided the equaliser with a downward header well saved by Mielitz, but just short of the hour-mark, the 05ers restored parity to proceedings. Radoslav Zabavnik hung an exquisite cross up in the air, and Szalai gleefully headed home. Mainz had deserved an equaliser on the balance of chances created and they looked good value for the 1-1 scoreline, keeping the hosts at bay with some disciplined defending. Substitute Niclas Fullkrüg forced Mainz stopper Christian Wetklo into a smart low stop, but for all their possession, Bremen looked laboured going forward. Then, with the minutes winding down on a gripping game, Hunt proved his worth to Bremen yet again by punishing Mainz’s profligacy for the second time. Yunus Malli made a hash of his shot in the Bremen penalty box and, with his team’s next attack, Hunt led from the front, winning and then converting a wonderful free-kick to give Bremen their second home win on the trot.